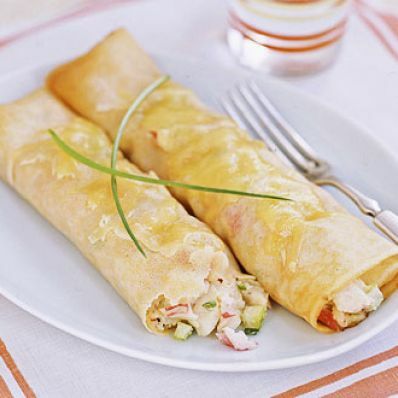 Imitation crab meat makes these crepes easy-on-the budget while your microwave and packaged refrigerated crepes make them quick and easy to assemble. 1 of 3 In large bowl, combine mayonnaise, water, Worcestershire sauce, nutmeg and pepper until blended. Add surimi, Parmesan cheese, 1/4 cup of the Swiss cheese, scallions and celery; stir to mix thoroughly. 2 of 3 With short side facing you, spoon 1/2 cup seafood mixture across bottom edge of each crepe. Roll, jelly-roll style, to enclose filling. Place seam side down into a microwave-safe individual au gratin dish or plate. Repeat with remaining crepes and filling, placing 2 crepes on each. 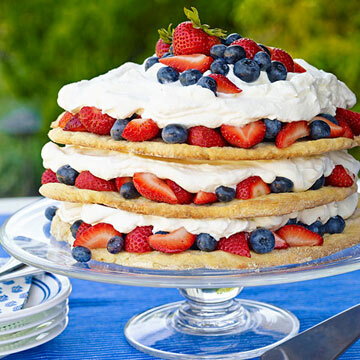 Sprinkle each crepe with 1 tablespoon Swiss cheese. 3 of 3 Cover with wax or parchment paper; microwave each on high 1-1/2 minutes until heated and cheese melts. Garnish with scallion tops. Makes 4 servings. Per Serving: 8 g sat. fat, 21 g Fat, total, 0 g fiber, 820 mg sodium, 72 mg chol., 22 g carb., 395 kcal cal., 30 g pro.